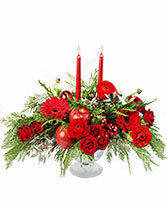 Mercury Glass Pedestal Vase, Red Tapered Candles, Red Ornaments, Apples, Holly, Assorted Christmas Greens, Red Gerberas, Red Spray Roses, Red Ranunculus. 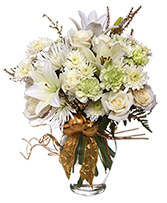 Ginger Vase, Foliage: Leather Leaf, White Asiatic Lilies, White Roses, Pale Green Carnations, White Cushion Poms, Small Gold Millimeter Balls, Gold Ting Ting, Gold Mesh Wired Ribbon. 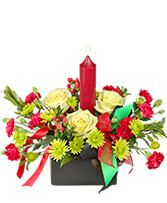 Square Black Ceramic Container, Wet Floral Foam, Red Candle, Foliage: Leather Leaf, Myrtle, Pale Green Jade Roses, Red Mini Carnations, Limegreen Athos Novelty Poms, Green Hypericum, Black Satin Ribbon, Green Satin Ribbon, Red Sheer Ribbon. 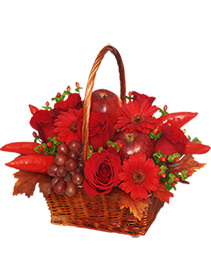 Square Willow Basket With Handle And Liner, Wet Floral Foam, Red Miniature Gerberas, Small Red Apples, Clusters Red Grapes, Red Roses, Red Hypericum, Red Chili Peppers, Preserved Oak Leaves. 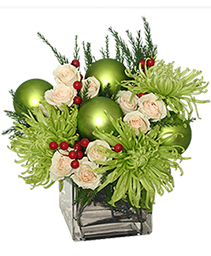 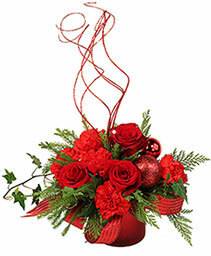 Green Cube Vase, Foliage: Seasonal Evergreens, Lime Green Fuji Mums, White Spray Roses, Red Berry Sprays, Lime Green Mm Balls. 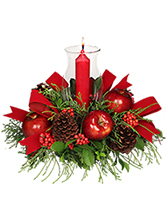 Utility Container, Wet Floral Foam, Red Candle, Hurricane Globe, Foliage: Salal, Myrtle, Seasonal Evergreens, Red Apples On Wooden Picks, Large Pine Cones On Wired Wooden Picks, Red Berry Sprays, Red Velvet Ribbon Loops On Wired Wooden Picks. 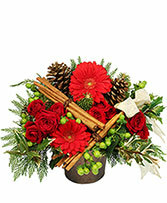 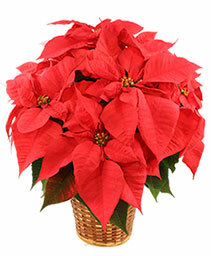 Brown Sparkle Bucket, Barkcovered Wire, Pine Cones, Goldsprayed Holly, Assorted Christmas Greens, Bunches Of Cinnamon Sticks, Red Gerberas, Green Hypericum, Spray Roses. 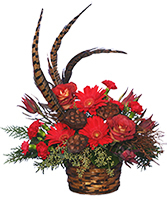 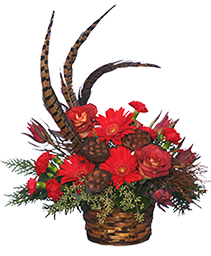 Inch Round Basket With Liner, Wet Floral Foam, Foliage: Seeded Eucalyptus, Galax Leaves, Assorted Evergreens, Red Gerberas, Leonadis Roses, Red Mini Carnations, Safari Sunset Leucadendrons, Birch Branches, Long Pheasant Feathers, Dried Lotus Pods. 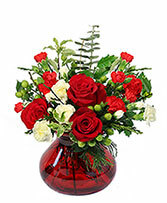 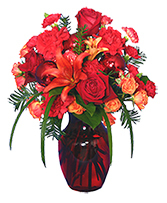 Inch Red Glass Vase, Foliage: Lily Grass, Salal Tips, Seasonal Evergreens, Rust Asiatic Lilies, Red Carnations, Orange Spray Roses, Red Roses, Red Mini Carnations, Red & Orange Variegated Mini Carnations, Red Millimeter Balls.